Sweet. It’s how we describe a great deal, an exciting adventure, or a plan that comes together. It’s what we crave sometimes … sugary, gooey goodness. It makes me think of newborn babies, toddlers exploring the world, and cuddly baby animals too. Somewhere along the years, the greeting card companies wanted in. Now Sweetest Day is kind of like Valentine’s Day in the fall, with 80 percent of all Sweetest Day cards having a romantic theme. 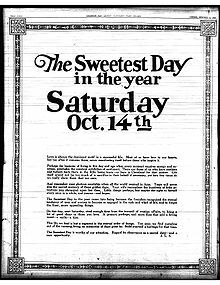 This year’s Sweetest Day is Saturday, October 17. And if you’re wondering what gift you might give to someone, especially a child, here’s an idea to consider. 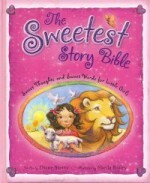 The Sweetest Story Bible for Toddlers is a 32-page board book with a padded cover. The pages and the cover have rounded corners–no danger of little ones getting poked in the eye! And, of course, it’s very pink! 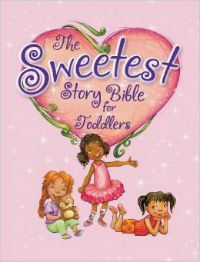 The Sweetest Story Bible for Toddlers includes eight stories, condensed from the originals to keep up with the shorter attention spans of toddlers (let’s say ages 1-3, but the book makes a sweet baby gift too!). Illustrations by Sheila Bailey from the original book fill most of each page. You can view a sampler and find purchasing options here. October 17 is also the day I’ll be signing Words to Dream On at Books by the Banks in Cincinnati, along with an amazing lineup of nearly 100 other authors for children, adults, and teens. Pretty sweet!